If you're looking for a sound to fill a big venue then be prepared to invest in multiple speakers and beef up the bass sound with a woofer of subwoofer, but for a small venue the FP208A could stand alone and is well worth investigating. Yoke bracket has multiple uses, tough and sturdy, good sound. Tone control is too crude, captive power lead, mic input should be on XLR. When it comes to choosing PA speakers, the first question you should ask yourself is: do I need passive or active. This isn't a description of the speakers' general attitude to life. Rather, it defines whether a speaker needs an amplified signal, or if it contains its own amplifiers. Which is preferable is a matter for debate and personal preference, but if active is your bag then Gear4Music may just have the system you for you. The FP208A 100W 8" Active PA Speaker is the entry point into Gear4Music's range of active PA speakers. The cabinet is compact and comes supplied with a yoke bracket that can serve various purposes. The most obvious is for mounting the speaker on a wall or ceiling as part of a PA installation, but it can also act as a convenient carry handle, or as a prop enabling the speaker to be positioned and angled on the floor in place of a wedge monitor. The cabinet itself is a moulded polymer affair, making it extremely robust and hard wearing. Inside the cabinet there is an eight-inch main driver featuring a titanium cone, a one-inch dome tweeter, and a pair of forward-facing tuned bass ports. The speakers are protected from physical damage by a strong metal grille covering the front of the unit, and are protected from signal overloads by a system Gear4Music calls 'automatic amplitude servo system', or AASS, for short. The company claims the system also improves the acoustic response of the speakers, but it is not A/B testable so we'll have to take Gear4Music's word for it. Around the back, signals are fed into the unit via an electronically balanced TRS jack socket (it can also take unbalanced signals). A second TRS jack socket, carrying a copy of the input signal, can be used to daisy chain additional speakers. The jack input can be switched between line and mic operating modes - although the lack of a dedicated XLR connector means you'll need an XLR-to-jack mic lead - and a mic gain control is provided for this purpose. Below this there is a tone control and, finally, the master volume control. Mains power is provided via a captive power cable rather than the more traditional IEC socket. Whilst this may make sense in an installation context, in a touring PA it could cause problems if - or, more likely, when - the mains cable develops a fault. The speaker has a clear and undistorted sound all the way through its volume range, right up to its punchy 113dB of SPL. That's not bad for a unit of this size, but means that, on its own, the FP208A is only sufficient for small venues. You'd definitely need a pair for anything more than a local pub gig or similar. Most people would combine two or more such units into a more complete PA system. If you only require a mono configuration then this need be no more complex than daisy chaining additional units via the speaker's 'aux out' connector. If you require stereo operation then you can simply drive one speaker, or chain of speakers, from each line output of your mixer. Technically, an eight-inch driver is not capable of producing low frequencies. A speaker cabinet such as this one can only produce low frequencies thanks to the inclusion of tuned bass reflex ports. These tune the air that is expelled from and sucked in to the cabinet as a result of the speaker cone's movement. Done correctly, this produces a large increase in the low-end output of speakers with smaller drivers. The FP208A does this very effectively, giving a solid bottom end down to 80Hz or so. But if you're a DJ, or installing a PA in a club, you're still going to need a woofer or subwoofer to fill up the very low end of the frequency spectrum. At the time of writing, Gear4Music don't offer such a unit, but maybe they should - a sub well-matched to this speaker would really bring the system to life. The Gear4Music FP208A only has one sound-sculpting tool and that is a tone control (models further up the range sport two- and three-band EQ controls). In its central position - easy to find thanks to a centre detent - no tonal adjustment is made. Turn the pot clockwise and the low end is rolled off whilst the top end is boosted. Turn the pot anticlockwise and it is the top end that gets the extra kick and the bottom end that is reduced. Whilst this tone control certainly has a marked effect on the sound, the crudeness of the control means it's not going to be of much practical use. However, as this is a powered speaker fed by a line-level signal, it would be easy to incorporate a separate graphic EQ in the signal chain that drives the speaker, and doing so would provide a much finer degree of tonal control. All in all, the Gear4Music FP208A is an impressive offering. There are no bells and whistles included, but you wouldn't expect any from an entry-level speaker. 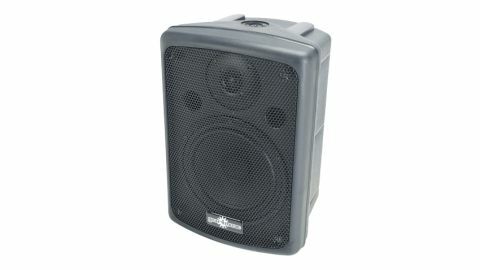 As the basis of a small PA system or installation this unit is certainly worthy of consideration.